Julie Bayl marks her publishing debut with the release of “Focus on Survival” (published by Xlibris AU), a biography chronicling a young family’s struggle to survive World War II. First published in March 2015, this book is set to receive a new marketing push this year. 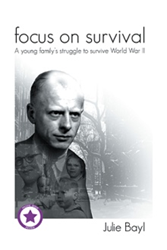 Collated through personal discussion with Bayl’s husband’s parents, Ben and Em, “Focus on Survival” details the indomitable courage of two typical Dutch citizens in wartime. Theirs is a heartwarming account of struggle and survival despite lack of food, electricity, heating, transport, etc. during the Nazi occupation of Holland. “The book covers many areas of civilian life and how that affects ordinary people’s lives. It is not focused on just one problem of war but the whole spectrum of challenges,” Bayl shares. Ben and Em’s plight depicts the strength of the human spirit and how their perseverance paid off, which is reflective of what is required in today’s critical issues, the author highlights. Julie Bayl was born in 1950 and grew up in Sydney. Upon leaving school, she was torn between a career in architecture or social work, being offered a 4-year scholarship for a cadetship with a renowned Sydney architectural firm or another option involving her love for people. She chose community based social work. In 1971, she married Charles Bayl, whose family had emigrated from Holland to Australia in 1953 seeking a better life. They moved to Cowra in 1974 and later had three children, Anita, Paul and David. They now have two grandsons, Lennon and Banjo.